Also available in 1 quart carton and 1 pint carton. 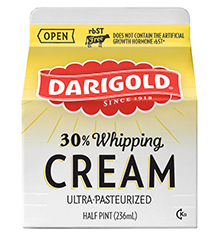 HEAVY CREAM (MILK), MONO- AND DIGLYCERIDES, CARRAGEENAN, DISODIUM PHOSPHATE, SODIUM CITRATE, POLYSORBATE 80. Gluten Free.